About 10 years ago I was eating a grapefruit and noticed one of the seeds inside had started to sprout. So, I put it in a small pot, and it grew into a decent sized plant - it got to about 4 feet tall. Back in March of this year, I thought I had killed the plant. I was house/cat sitting for some friends for the month and completely forgot about the plant back at my condo. When I finally returned home, all the leaves had shriveled up and had mostly falled off. I continued to water the plant in hopes it wasn't completely dead, but for the whole month of April, it was just a stick with no leaves at all. 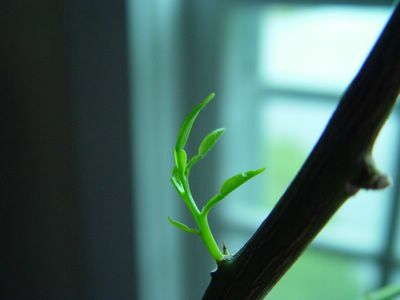 Fortunately, the plant is now returning to life as can be seen by these few sprouts of green. It's a good thing the only life I'm responsible for is a plant. ha! and you thought it was dead!